What does it mean by “reach for a banana”? 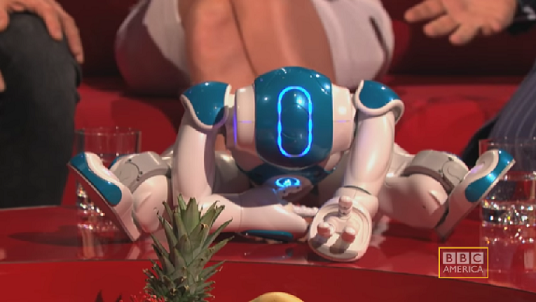 In this video one of the panel said "he is reaching for a banana" after seeing the robot got down on the desk. I thought this would be an idiom or some phrase that would be found in the urban dictionary, but I cannot find any hints on the Internet. Could anyone please tell me if it means something special in colloquial English? No, it doesn't. It was meant literally here. In the literal, physical sense, the "for" in "reach for something" indicates the thing that the person is trying to reach. I'm guessing you know this already, that's why you were looking for a non-literal usage. Where does the monkey go in? He's joking that in reality a monkey enters the robot and controls it. I think it's reaching for a banana. In my opinion, that arm gesture is commonly associated with primates. Also notice that there is a plate of fruits on the table, and next to the pineapple there is in fact a banana. The second speaker was just continuing the first speaker's joke, as a monkey would want to try to grab the banana. Otherwise, he was simply making a funny, but literal, observation. Not the answer you're looking for? Browse other questions tagged phrase-meaning idioms colloquial-language or ask your own question. What is a “complete secret”? What does “I feel for that” mean? What does “For next to nothing” mean? What does it mean “a fork stuck in the road”? What does “I am no chicken” mean? Is “felt in the way” an idiomatic expression or it has a literal meaning? What does “there's no way around” mean?